What Saudi Arabia wanted, the controversial federalization of Yemen imposed by an illegitimate president who currently lives in exile in Saudi Arabia, this is the plan Ansarullah opposes for their country. In North Yemen, Zaydism is very deeply connected and intertwined with Yemeni nationalism, given that the state traces its modern independence to armed resistance against the Ottoman empire during World War I, led by Imam Yahya Muhammad Hamideddin. Upon being chosen as Imam in 1904, Yahya Hamideddin set to work building up his nation’s strength, and successfully achieved effective rule over much of North Yemen by 1911. In 1918, taking advantage of the weakened state of the Ottoman Empire, he re-established Yemen as a fully independent Imamate and was proclaimed the supreme ruler over all of the country, uniting all of the land between the British colony in South Yemen, and the Hijaz (the area in which Mecca and Medina are located) to the north. The new Imamate also set to work to ensure tolerance of different faiths in the nation, including protection for the domestic Jewish population, which was still of a significant size at the time. The port cities of Mocha and Taiz were modernised, and a national trading company was established. Envoys and students were sent abroad, mainly to Iraq and Lebanon, to learn of new developments that could benefit Yemen, and a modern standing army was founded. Imam Yahya even allowed former Ottoman officials to remain in Yemen, provided they submit to the sovereignty of the Imamate. British envoys like intelligence officer Gilbert Clayton, who visited Yemen in the hope to establish some form of control or at least goodwill towards the British Empire, came back empty-handed, but often with great appreciation for the Imamate’s administration, political organisation and military prowess. Another contemporary British source, Lieutenant-Colonel Harold Jacob, described the Imam with the words. "Imam Yahya is a strong ruler. His sanctity as High Priest of the Zaydi sect and his descent from the Prophet's family adds to the prestige which his benign rule has won. His methods are patriarchal and humane. His one hobby is Yemen"
The British harboured great distrust for the Yemeni Imamate, which their Saudi allies wished to swallow. They saw it as a sovereign nation directly to the north of their so-called colonial “Aden Protectorate”, as their South Yemeni colony was called, and used the city of Aden as a haven for anti-Imamate forces. Saudi Arabia, having conquered or massacred all tribes in most of the northern peninsula, and still keen on expanding its borders, went to war with Yemen in 1934. With extensive British military support, the Saudis succeeded in forcing Imam Yahya to give up Baha, Asir, Najran and Jizan, which remain occupied areas under Saudi rule up to today. Historically, these territories were part of Yemeni civilisation, whereas the Saud clan are from the region of Nejd, modern day Riyadh province. Eventually, Imam Yahya Hamidaddin was assassinated in 1948, under suspicious circumstances in which Great Britain was likely involved. In the chaotic period of infighting that followed Imam Yahya’s assassination, eventually the throne was taken by his son, who took the title Imam Ahmad ibn Yahya. Ahmad, however, was unpopular, ruthless, and incompetent, and most importantly, he was never elected in the due process that was so key to the political system of the Imamate. 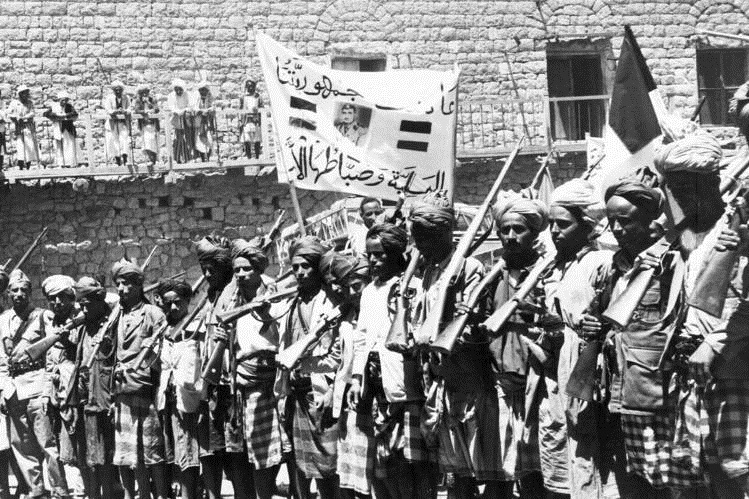 While there were several attempts to re-establish the original concept of Yemen’s unique ‘theocratic democracy’ to Yemen, these were all ruthlessly put down, and Ahmad would rule until his death in 1962. Under his rule, cronyism, tribal divisions, favouritism and corruption started spreading throughout the country, severely hampering its prosperity and stability. When in 1962, Ahmad passed away, power passed on to his son, Muhammad al-Badr. Despite the fact that Muhammad al-Badr was known as a modernising and potentially progressive figure, who was known to maintain extensive contacts in both the Soviet Union and Nasser’s Egypt, the fact that he too succeeded his father to the throne of the Imamate without any election or tribal consultation, led to severe dissatisfaction. All these things were major factors for why those modernising Yemeni republican officers attempted to topple the Imamate in a 1962 coup d’état triggering the North Yemen civil war. Ironically in a sense they were rebelling against unjust rulers just as Zaydism had historically preached. However, in their often rash and fast-paced attempts to “modernise” the country, they attacked not just the regime of Muhammad al-Badr, but the entire concept of the Imamate, proclaiming instead that they wanted to establish an Arab nationalist republic. While the September 26 Revolution of 1962, led by Abdullah al Sallal who would become North Yemen’s first president, may have had noble goals and intentions, and its ideals are nowadays supported by most political forces in Yemen (including Ansarullah itself), at the time it was seen by many as a form of external intervention, led by Egypt. It didn’t help that as many as 70,000 Egyptian troops were stationed in the country by 1965, further increasing the idea that this was an Egyptian-led incursion into the country’s domestic affairs. While Nasser’s idea of pan-Arab unity against imperialism was a noble one, the way the Yemeni conflict was handled, hampered its popularity. Tribesmen from all over the country, especially the north, joined the royalist forces in droves, counting up to 200,000 by 1965. Muhammad al-Badr’s cause also suffered from popularity issues however, especially since it found two main sponsors and supporters in the United Kingdom and Saudi Arabia, two countries whose influence was very much opposed by many. Saudi Arabia hated the Yemeni Imams but because their main enemy in the 1960s was Egypt under President Gamal Abdel Nasser, the hero of the Arab world at the time, the monarchy and their British backers sided with the self-proclaimed “Imam” against the modernising secular republicans espousing Arab nationalist politics, who had excellent ties with Egypt under Nasser who openly portrayed the House of Saud as representing everything that was holding the Arabs back. One famous Nasser quote from that era was "to liberate Jerusalem the Arabs must first liberate Riyadh". Two early developments made things worse for Yemen. In 1967, Egypt was attacked by Israel. Having much of its best troops stuck fighting in Yemen, Egypt was defeated in the Six Day War that followed, severely hampering its potential to aid the Republican cause. By 1968, the supporters of Muhammad al-Badr had the Republicans Sana’a surrounded, but when it seemed that the Imamate’s forces would win the day, Saudi Arabia cut off the Imamate’s forces causing them to run out of ammunition. This resulted in a Republican victory, and in 1970, Saudi Arabia went even further, and in a shock-decision suddenly recognised the newly formed Yemen Arab Republic, swiftly followed by the United Kingdom and much of the West. Suddenly being faced with much of the Western world opposing him, Muhammad al-Badr gave up, and a peace treaty was signed not long after. The Republican leader Abdullah al-Sallal had been proclaimed President of Yemen during the war but had only lasted until 1967 when he was ousted by Abdul Rahman al-Iryani. Iryani established official relations with Saudi Arabia and successfully negotiated the integration of former royalist officials into the Republic. Although Iryani established an official constitution and actual parliamentary elections for the first time, the pan-Arab revolutionary zeal that characterised the Republican movement withered under Iryani, corruption and cronyism ran rampant, and the influence of Saudi Arabia became grew stronger. In 1974 another bloodless coup took place, led by Ibrahim al-Hamdi. A pan-Arab Socialist, al-Hamdi led the Revolutionary Correction Movement, and although he only ruled for three years, he oversaw a period of great prosperity that witnessed rising living standards made possible by land reforms, and egalitarian economic policies that addressed the interests of the poor. Thousands of schools, clinics and hospitals were built all over Yemen, and the influence of Saudi preachers was greatly curtailed. Reunification was on the agenda for both North and South Yemen. After a bloody struggle against British colonialism, the South had become independent under a Marxist-Leninist government, and had established the Democratic People’s Republic of Yemen. President al-Hamdi had put unification of North and South on the agenda, and had planned a high-stakes meeting with the South Yemeni leadership on October 13, 1977. However, just two days before this meeting could take place, al-Hamdi was assassinated on the orders of Ahmad al-Ghashmi, with support of Saudi Arabia. Al-Ghashmi took over as president of the Yemen Arab Republic after al-Hamdi’s death, but was himself assassinated only eight months later, incidentally at the very moment when he was meeting with a South Yemeni envoy to discuss unification. After a very short tenure by seasoned Republican Abdul Karim Abdullah al-Arashi, the presidency of Yemen was taken over in July 1978 by Ali Abdullah Saleh who remained in power until 2012 after being forced to step down due to popular pressure. In 1990, Saleh succeeded in reunifying North and South Yemen, but only by completely dismantling the Socialist system that had been in place in the South, and by ruthlessly cracking down on all dissent by Southerners. In 1994, Saleh and his ruthless military commander Ali Mohsen al-Ahmar mercilessly massacred all opposition across South Yemen, resulting in up to 10,000 casualties. That same year, however, a Zaydi scholar and political activist named Sayyid Hussein Badreddin al-Houthi founded an organisation that would dedicate its entire existence to the what it called the completion of the 1962 Revolution: Ansarullah. The rest is history. Yemen, once the most prosperous nation on the Arab Peninsula, became an impoverished nation, used by its ruthless and corrupt leadership as if it were their personal property. Under Saleh, military rule, cronyism and corruption ran rampant in the country, and the influence of Saudi Arabia increased to such an extent that Yemen came to be seen as Saudi Arabia’s “backyard”.